If you’re over 30, DreamHack considers you to be a senior, at least in the world of competitive Counter-Strike. The tournament organizer has announced that DreamHack Summer 2017, held June 17 through 20 in Jönköping, Sweden, will host four special Counter-Strike tournaments for juniors, seniors, women and free-for-all players. 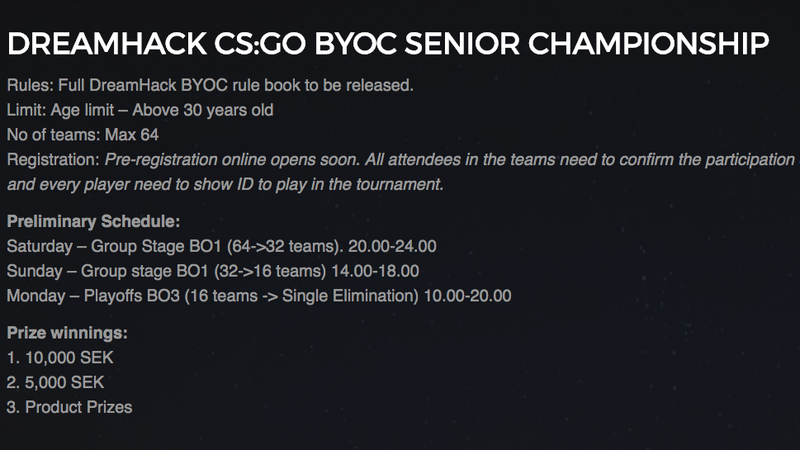 These BYOC (bring your own computer) tournaments will reward 10,000 SEK to the wiliest team of seniors at the event, given they’re over the age of 30. Though there’s been some reference to research which claims response times in games like StarCraft begin fading after age 24, there are several professional Global Offensive players who are creeping up on this age, including Taz, Zeus and Edward. So if you’re over 30 and feel pretty good about your reaction times, you can head down to Sweden and take a shot at some other old geezers. Sadly, there doesn’t seem to be a tournament final that pits the young against the old, but there’s always next summer.